Descartes has acquired the businesses run by the Management Systems Resources Inc. group of companies operating under the names “Visual Compliance,” “eCustoms” and “MSR” (collectively, “Visual Compliance”). Visual Compliance provides software solutions and services to automate customs, trade, and fiscal compliance processes, with a focus on denied and restricted party screening and export licensing. Visual Compliance is based in Canada and serves over 2,000 customers with over 67,500 subscribers operating in over 100 countries. Strengthening Descartes’ domain expertise and toolset for collecting and distributing trade compliance content. Descartes’ GLN is the foundation on which the applications and community are built. The GLN provides community members the flexibility to easily connect and collaborate with global trading partners. The Visual Compliance acquisition expands the reach and concentration of the GLN with additional denied party screening and trade compliance transactions. Visual Compliance’s denied party screening content extends Descartes’ wider Trade Data Content offering that includes comprehensive data on HTS classification, duties, regulations and rulings, to power a number of large global trade management (GTM) application providers, like SAP and Oracle, which can drive additional volume on the network. Descartes’ product strategy is focused on expanding its logistics application functional footprint to provide its customers with the most comprehensive logistics management solutions in the industry. Visual Compliance enhances Descartes’ compliance application footprint for denied party screening, party management and workflow, and Canadian imports, as well as adding new trade compliance functionality such as export license controls. 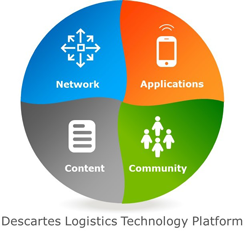 Descartes’ logistics community is the largest multi-modal network of logistics-intensive companies in the world, with parties using its cloud-based services in over 160 countries. In continuing its mission to create the world’s most comprehensive networked logistics community, the acquisition adds approximately 2,000 trade-intensive customers to Descartes’ community. Descartes’ leading platform combines regulatory trade data and logistics trade data to improve market research, reduce the risk of transacting with denied or restricted parties, perform shipment classification and valuation to minimize duty spend, and improve shipment planning and execution. The Visual Compliance acquisition strengthens Descartes’ domain expertise and toolset for collecting and distributing trade compliance content. Visual Compliance provides software solutions and services to automate customs, trade and fiscal compliance processes, with a focus on denied and restricted party screening processes and export licensing. Visual Compliance is based in Canada and serves over 2,000 customers with over 67,500 subscribers operating in over 100 countries. Denied/restricted party screening is the review of people, goods, services and/or commodities against comprehensive lists published by governments and international organizations identifying people, organizations and countries with whom it is illegal or restricted to transact business. In the international trade context, compliance with these sanction lists is actively enforced by governments around the world, with consequences including large fines, revocation of export privileges and/or criminal prosecution. Both Descartes and Visual Compliance provide data, content and solutions to customers and partners, like SAP and Oracle, to enable comprehensive global trade compliance reviews to be completed. The acquisition makes Visual Compliance’s customers members of the world’s premier global logistics community – The Global Logistics Network – facilitating improved performance and productivity of logistics operations around the world. As part of this community Visual Compliance’s customers will have access to additional solutions and global trade content via Descartes’ Logistics Technology Platform to improve electronic connectivity and collaboration with trading partners, customs and cargo security compliance, transportation management, in-transit shipment visibility, and more. Visual Compliance’s office is in Toronto, Ontario. You can visit the Visual Compliance website at https://www.visualcompliance.com.